- Ingredients: Sesame, Chilli, Ajwain, Common salt, Turmeric. Banking on our enriched industry experience, we are able to supply Chakali Masala. Our reputed entity is engaged in supplying Chakali Masala. From our wide consignment, we are affianced in supplying Chakali Masala. We are a top-notch organization, engaged in providing Chakali Masala. 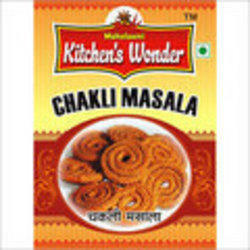 Our company has gained name and fame in presenting Milan Chakli Masala. Acknowledged as one of the eminent name of the industry, we are instrumental in offering Chakali Masala. Chakali is the queen of Diwali faral recepies. Diwali is incomplete without chakli. 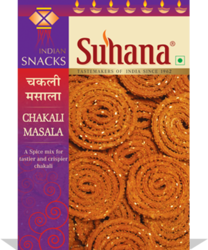 For tasty and crispy chakli use our Chakali Masala. Leveraging on the competence of our accomplished and assiduous vendors, we have been engaged in offering Chakali Masala. Clients can avail this namkeen from us in different packing option. Due to our devoted professionals, we have been accomplished to offer an extensive quality of Chakali Masala. We have adequately puts ourselves as an eminent name involved in offering a delectable arrangement of Chakali Masala. In order to meet excellent quality standards, we are supplying Chakali Masala. Sesame, Chilli, Ajwain, Common salt, Turmeric. We are amongst the most reputed names in the industry, offering Chakali Masala. This Chakali Masala is ideal for frying crispy wafers. We are ranked on top by offering best quality of Chakli Powder, which is known for its remarkable finish and quality.